1. Reducing cost – At a glance this seems to be the biggest favor factor. Server consolidation of 3:1, 2:1 and even 10:1 or more. But the missing picture is this true to my company? Can I really archive that kind of consolidation ratio? This is a question need to be ask from your IT department. How can I know which servers are the best candidates to consolidate? Depend on the answers we’re getting out of that, companies need to decide virtualization strategy. 2. Power / Cooling saving – These are some of the direct benefit of the virtualization. Reduce the server for print in your data center will lead for you to spend less money on the power and data center cooling. 3. Standardization / Compliance – These are some of the indirect benefits companies can achieve. System administrators will be able to better manage server operating systems and applications in the virtualizations systems by using system management products. Bringing the entire data centers into standardized environment will bring better Service Management and also will help companies to compliance with industry regulations. Looking at a glance we have so many advantages moving to server consolidation and better utilization of existing hardware through server virtualization. So what is the catch the hidden untold story of the server virtualization? Server virtualization not always going to utilize your existing servers. As I have seen in our market most of the companies are still having 5-6 old servers in production. You’ll need to invest on new hardware. Better of all have a god planning on how to recover from one physical server which host several servers. 4. Cost – Virtualization will itself is not going to bring immediate ROI if you didn’t plan well but another over burden to our IT budget. Additional storage cost, network equipment, servers….etc you name it cost will go if you didn’t identify the above mention goals properly. Know what you need to virtualized and how to protect them as well. So where we end up on server virtualization? How can SMB, SME or Enterprise enjoy this technology? Number one rule is take time for careful planning. Use the given free tools to better understand your environment and plan the resources well ahead. Virtualization is not only limited to server side so you can be carried out by many factors. Know the company business objective and how to drive them with virtualization. None of the above mention facts are to keep you away from virtualization. My honest opinion is virtualization (may it be server, application…..etc) is really good but little bit of extra planning will make your life easier. What is clustering – In its most elementary definition, a server cluster is at least two independent computers that are logically and sometimes physically joined and presented to a network as a single host. That is to say, although each computer (called a node) in a cluster has its own resources, such as CPUs, RAM, hard drives, network cards, etc., the cluster as such is advertised to the network as a single host name with a single Internet Protocol (IP) address. As far as network users are concerned, the cluster is a single server, not a rack of two, four, eight or however many nodes comprise the cluster resource group. 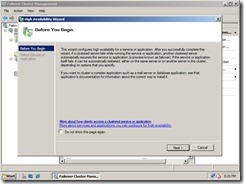 Why cluster – Availability: Avoids problems resulting from systems failures. Scalability: Additional systems can be added as needs increase. Lower Cost: Supercomputer power at commodity prices. Often deployed for tasks previously handled only by supercomputers. Used for scientific or financial analysis. Used to increase the availability and serviceability of network services. A given application runs on only one of the nodes, but each node can run one or more applications. When an application or node fails, its services are migrated to another node. The identity of the failed node is also migrated. Works with most applications as long as they are scriptable. Used for database servers, mail servers or file servers. Used to increase the availability, serviceability and scalability of network services. A given application runs on all of the nodes and a given node can host multiple applications. Large cluster pools are supported. When a node or service fails, it is removed from the cluster. No failover is necessary. Applications do not need to be specialized, but HA clustering works best with stateless applications that can be run concurrently. Systems do not need to be homogeneous. Used for web servers, mail servers or FTP servers. Now coming back into the Microsoft clustering clustering it goes back to good old NT 4.0 era with the code name “wolf pack” After that Microsoft clustering technology came all the way step by step growing and improving. Windows 2000 period giving the confidence for customers on the stability of the Microsoft clustering technology. 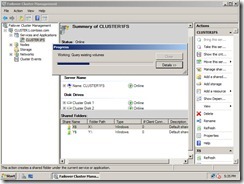 If there are filed engineers who have configured the Windows 2003 clustering will know the painful steps they have to follow configure the clustering. When it comes to Windows 2003 R2 Microsoft offered various tools and wizards to make the clustering process less painful process to engineers. 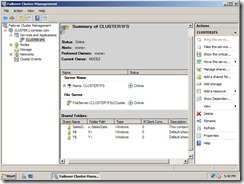 If you’re planning to configure windows 2003 clustering one place you definitely look into is this site. As I always have been updating the audience in public sessions clustering is no longer going to be a technology focus by Enterprise market. 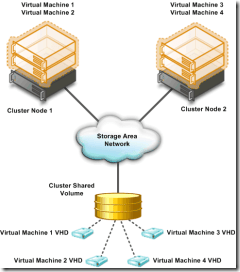 Clustering can be utilized by SMB and SME market as well with a fraction of the cost. As usual I will be focusing on the HYPER-V and how combine with clustering can help the users to get the maximum benefits out for virtualization and high availability. HYPER-V been Microsoft flagship technology for the virtualization. It’s a 100% bare metal hyper visor technology. There are lot of misguided conception on HYPE-V is not a true hypervisor, the main argument point highlighted is you need to have windows 2008 to run the HYPER-V. This is wrong!!! 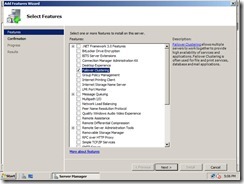 You can setup on the HYPER-V hyper visor software in bare metal server and setup the virtual pc’s. HYPER-V only free version can be download from here. Comparisons on HYPER-V can be found over here. 2. 8 GB memory and minimum 3 nics. always better to have additional nics. 3. 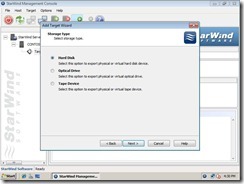 2*76 GB SAS or SATA HDD for the Host operating system. Now the above system has the full capability to handle decent amount workload. Now the configuration part 🙂 I’ll try to summarize the steps along with additional tips when necessary. 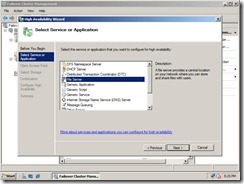 Following steps will help you to configure a Windows 2008 File server cluster. 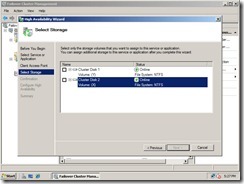 HYPER-V high availability will be followed the same steps. Due to hardware limitation I have decided to demonstrate Windows 2008 File server clustering. 1. 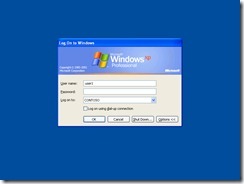 Install windows 2008 Enterprise or Datacenter edition to each Host computer. Make sure both of them get the latest updates and both host will have same updates for all the software. 2. Go ahead and install the HYPER-v role. b) Second NIC will be the heartbeat connection between the 2 host servers. So add IP address and the SB only. Make sure it will be totally different IP class. 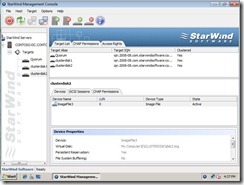 c) Third NIC will be configured to communicate with the SAN storage. I’m assuming we’ll be using iSCSI over IP. 4. Now for the SAN storage you can go ahead and buy the expensive SAN storage for HP, DELL or EMC (no offence with me guys 🙂 ) but their are customers who can’t afford that price tag. For them the good new is you can convert your existing servers into a SAN storage. We’re talking about converting you’re existing x86 systems into Software based SAN storage which use iSCSI protocol. There are third party companies which provide software for this. Personally I prefer StarWind iSCSI software. So all you have to do is add enough HDD space to your server and then using the third party iSCSI software convert your system to SAN storage. This will be the central storage for the two HYPER-V enabled host computers. 5. 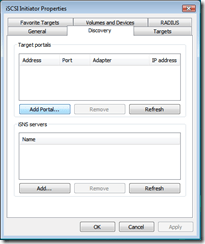 Go to one host computer and then add the Clustering feature. 8. 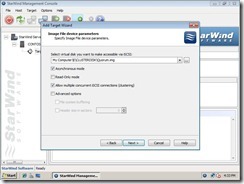 Go to Host2 open iSCSI imitator and add the SAN storage. 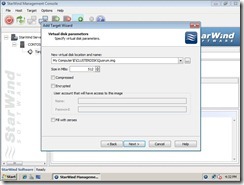 Go to Disk management and add the same drive letters to the disks as configured on Host1. 9. 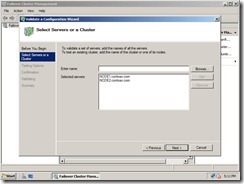 Go to cluster configuration and start setting up the cluster. 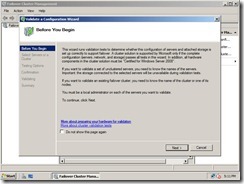 One cool thing about Windows 2008 cluster setup is cluster validation wizard. 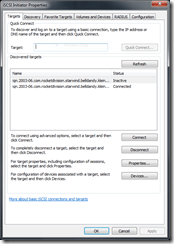 It will do a serious of configuration checkup to make sure if you have configured the cluster setup steps correctly. This wizard is a must and you need to keep this report safely in case if you need to get Microsoft support or a technical personas support. 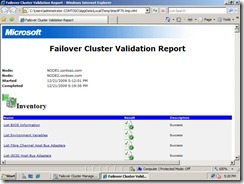 One the cluster validation completed we can go ahead add the cluster role. In this case we’ll be selecting File Server as our cluster role. 10. 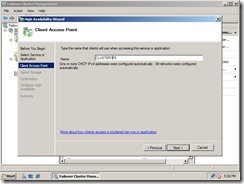 Once the cluster validation is completed, go ahead and create a cluster service. 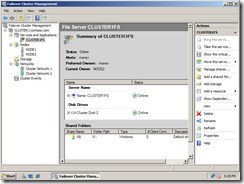 In this demonstration I’ll use clustered file server feature. Phew…!! that was a long article I’ have every written 🙂 Ok I guess by now you’ll have the idea Windows 2008 clustering is not very complicated if you have the right tools and the resources. Now that is the out layer internally to secure the environment we’ll need to consider about either CHAP authentications, IPSec…etc. Since this is 101 article i kept everything is simple manner. Let me know your comments (good or bad)about the article so I’ll be able to provide better information which will be helpful for you all. Now coming back into the Microsoft clustering clustering goes back to good old NT 4.0 era with the code name “wolf pack” All this time it came all the way step by step growing and shine on Windows 2000 period giving the confidence for customers on the stability of the Microsoft clustering technology. If there are filed engineers who have configured the Windows 2003 clustering will know the painful steps they have to take to configure the clustering Steps are very lengthy. 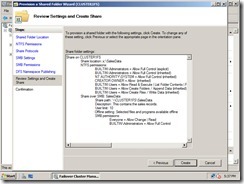 When it comes to Windows 2003 R2 Microsoft offered various tools and wizards to make the clustering process less painful process to for engineers. 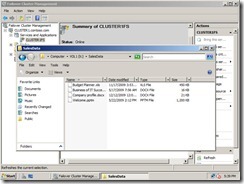 If you’re planning to configure windows 2003 clustering one place you definitely look into is this site. As I have been updating the audience in public sessions clustering is no longer going to be a technology focus by Enterprise market. Clustering can be utilized by SMB and SME market as well with a fraction of the cost. As usual I will be focusing on the HYPER-V and how combine with clustering can help the users to get the maximum benefits out for virtualization and high availability. HYPER-V been Microsoft flagship technology for the virtualization. It’s a 100% bare metal hyper visor technology. There are lot of misguided conception on HYPE-V is not a true hypervisor, the main argument point highlighted is you need to have windows 2008 to run the HYPER-V. This is wrong!!! 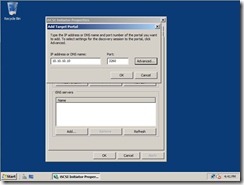 You can setup on the HYPER-V hyper visor software in bare metal server and setup the virtual pc’s. HYPER-V only free version can be download from here. Comparisons on HYPER-V can be found over here. So you have been running on Windows 2000 or Windows 2003 AD environment for quite some time and prefer a change. 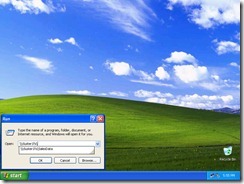 Windows 2008 has been out there for almost 16 months now, including the release of Windows 2008 R2. In this article we’ll discuss some of the key facts you need to consider before you jump into upgrade process and some of the pit falls you need to avoid. What are the upgrade options available for me? Apart from that consider your Domain and Forest functional level as well. In windows 2008 R2 you’ll have some cool roles and features but to get that you need to upgrade the functional levels to R2. Consider the following facts. Ensure the demotion of your existing DCs is fully replicated to all your other DCs before promoting the replacement (if re-using the same name and IP address). Any other services/applications running on your existing DCs (e.g. CA, WINS, DHCP, File and Print). Applications and systems that may be impacted during the outage of your DCs during the demotion/promotion (i.e. those that may be hard-coded to the name or IP address). 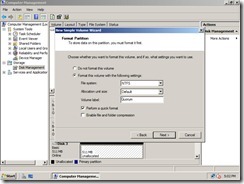 Transitioning is possible for Active Directory environments which domain functional level is at least Windows 2000 Native. In a way this is my favorite method considering the risky method of in-place upgrade. Restructuring – In this method you’re going to create a total different domain and transfer the existing domain details (Eg: user accounts, passwords, profiles…etc) to the new domain. One good example is when a company having two or three domains and they wanted to merge to a one domain name. Microsoft ADMT is one of the useful tool in this scenario(Active Directory Migration Tool) Apart from that there are third party tools available to this kind of transition. when it comes to upgrade your domain environment careful planning is vital in the beginning to avoid unnecessary problems which can be lead to un-reversible. So take good time to read the documentation and do the lab environment tests. Here is a one good article which can give you some useful information. Few weeks back I had the privilege to conduct a session on Windows 2008 R2 and it’s new features. This session has been combined with Windows 7 and it’s new features. Windows 7 session has been conducted by Sabeshan. He is one of the Microsoft Certified Trainer in NetAssist. We have conducted this session to audience who comes from filed engineer to IT manger level. So instead being too techie of the product features we highlighted the technology and how they can implement and get quick ROI from their network. When it comes to new technology some companies are slow adaptors and especially with few Enterprise companies. With Business perspective side there are few reasons for that. We wanted to break that barrier and demonstrate how effectively they can use the technology and get their expectations with less complex setup. Though we didn’t went on deep technical level on that day our future sessions will be deep dive into each product feature with live demonstrations. We kept on demonstrating Windows 7 bit locker features, VHD boot up, Windows 2008 Active Directory Administrative Center, Recycle bin, PowerShell, Group Policy new feature usage….etc. Direct access could have been preferred one but with limited time frame I had to keep that away for a later time.